“Buy 3 packs of selected Designer Series Paper and choose a fourth pack for free”. 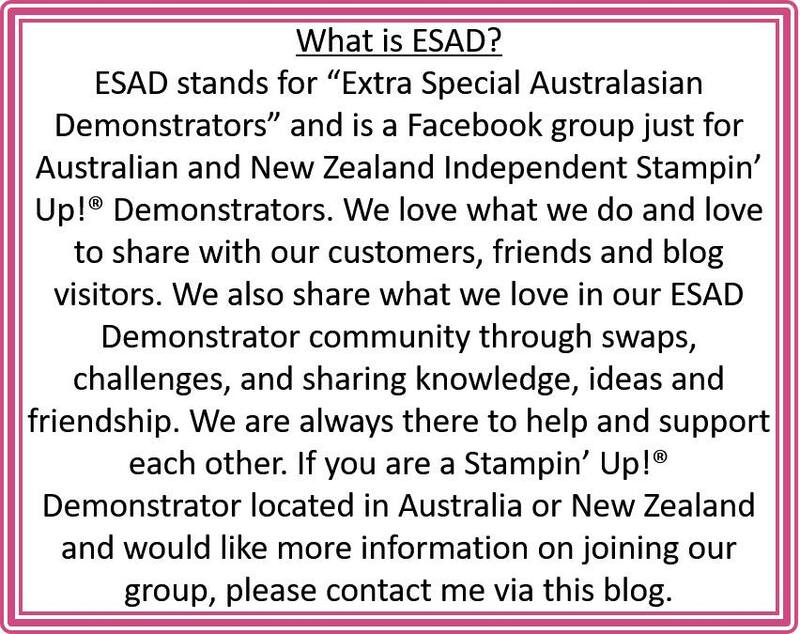 You might be asking “what in the heck is ESAD”? Today I am featuring the Garden Impressions 6″ x 6″ paper. 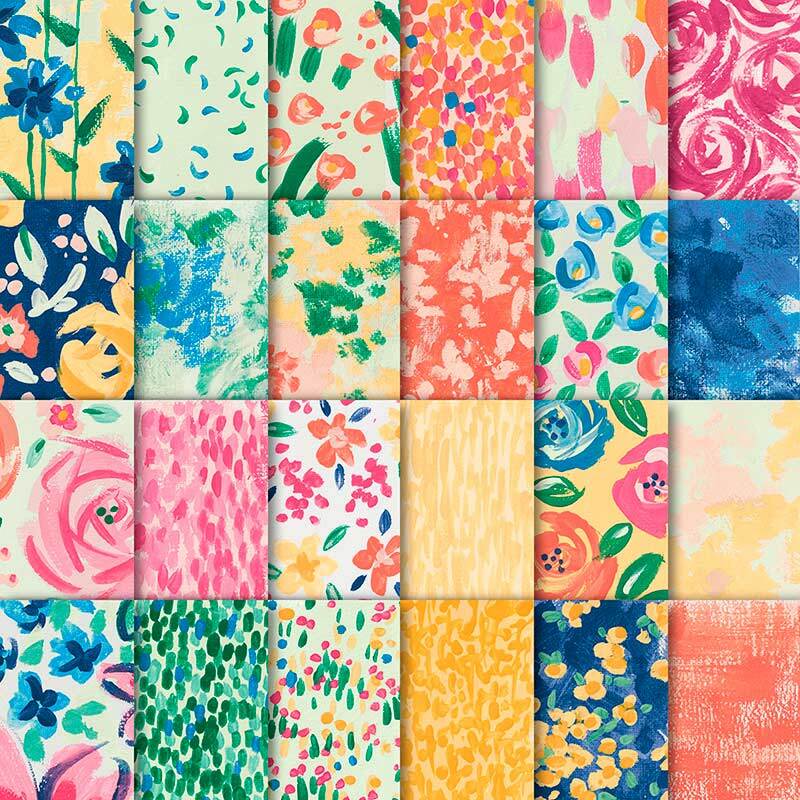 It is a fabulously and unashamedly riotous mix of Monet type floral patterns. I love it. Now, I got a bit carried away and created a heap of projects using this paper for my post today, but the rules say to try and keep it to 3 projects! This is to keep the blog posts short and easy to read as there are 20 of us in the hop today. So here are five of the cards I created and I will just focus on my favourite two cards today and post more info on the other cards later in the week. This paper is fabulous to use as a feature. 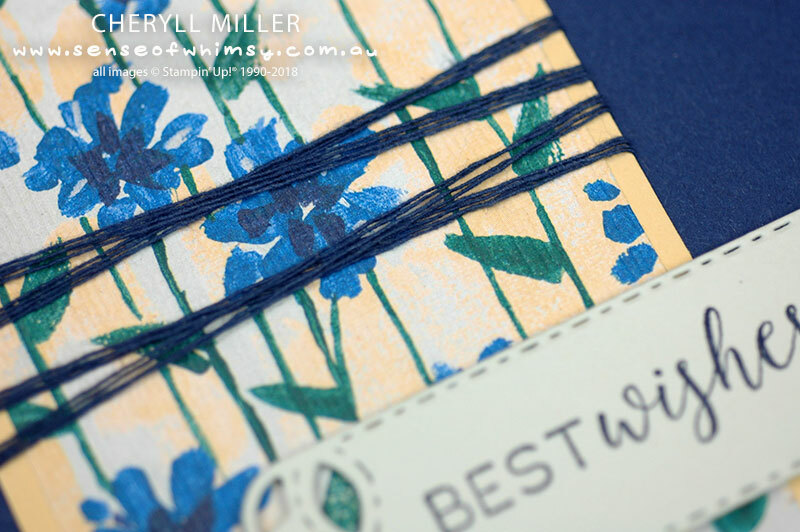 I chose to use the Stitched All Around Stamp Set and the co-ordinating Stitched Labels Framelits, and chose a few card colours from the Designers Series Paper. It is such fun to sit down with selected products and just create many different layouts with just those products. This is my favourite of the group …. I am not quite sure if you can see it in the pic, but the floral paper has been embossed with the Textured Impressions Dynamic Embossing Folder “Subtle”. 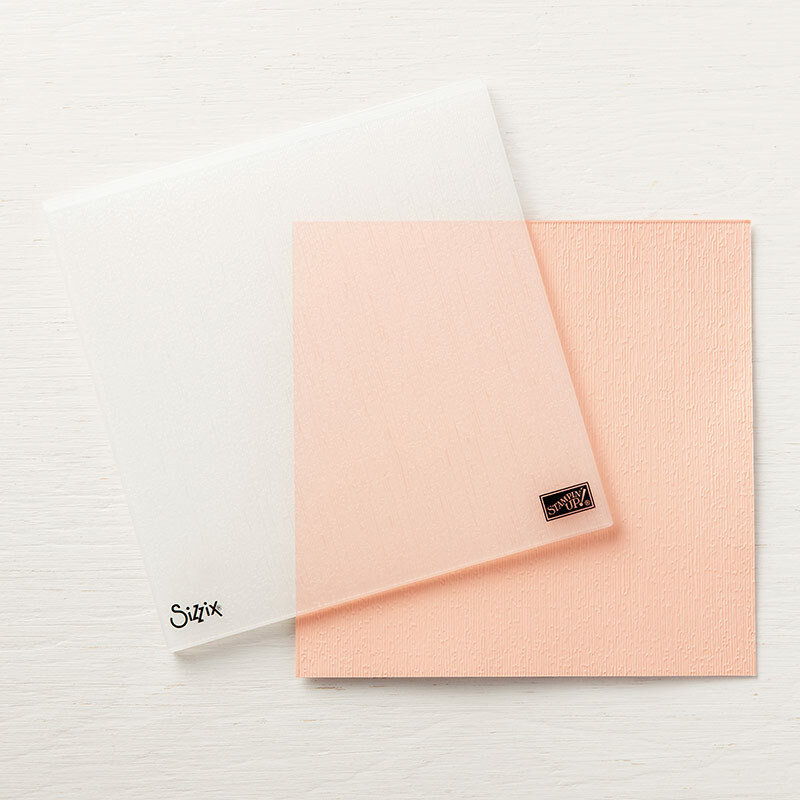 It is a subtle, but totally delicious embossing folder that creates a very subtle linen look texture. Can you see the texture in the floral piece? 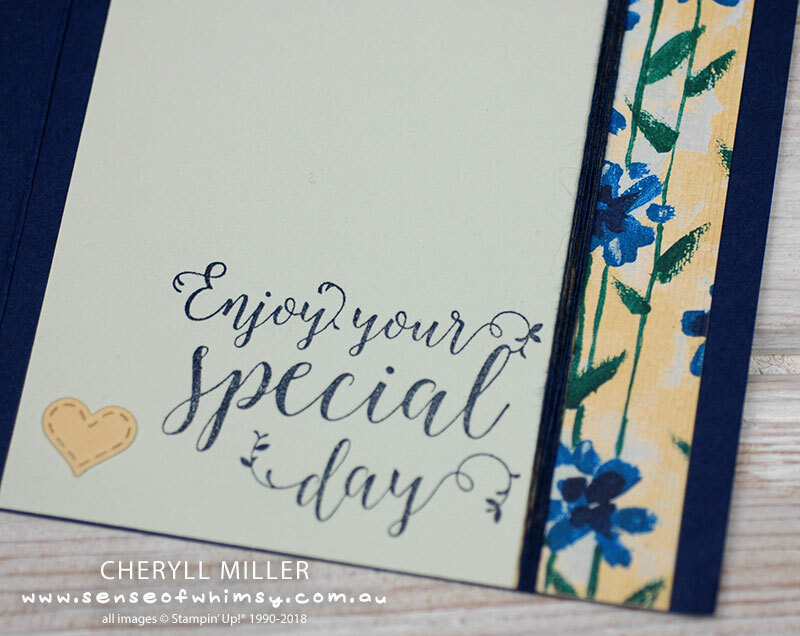 All the cards I created have some element using the Subtle Textured Impressions Dynamic Embossing Folder. I used the Night of Navy Medium Baker’s Twine, pulled it apart and selected to use just a few strands to wrap around the feature piece. As always, while all the materials are out, I do the insert for my card. For my next favourite card, I have used that cross stitch background die from Stitched Labels Framelits directly onto the card front. Soft Sea Foam (love) is the base card and after cutting that gorgeous cross stitch pattern into top left and bottom right corners of the base card, I die cut a large label stitched die from another piece of floral paper which has been embossed with the Subtle Dynamic Embossing Folder. So pretty! The long intricate label die is tied on with the Night of Navy Baker’s Twine. And you can rally see the texture in the die cut floral label. Again, the inside is completed to co-ordinate with the front of the card. The blog hop participants today are an impressive line up so grab a cuppa or a glass of wine, depending on your time of day, and take 10 minutes to hop around and check out the other projects. 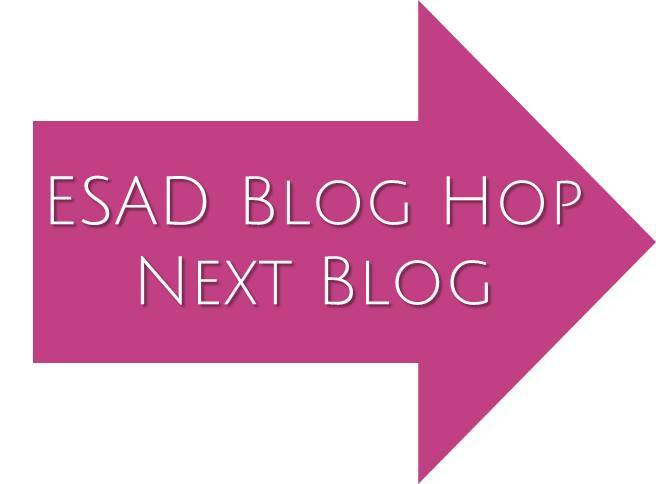 Click on the big pink arrow to hop on over to the next blog post, which is Denise Buetler. 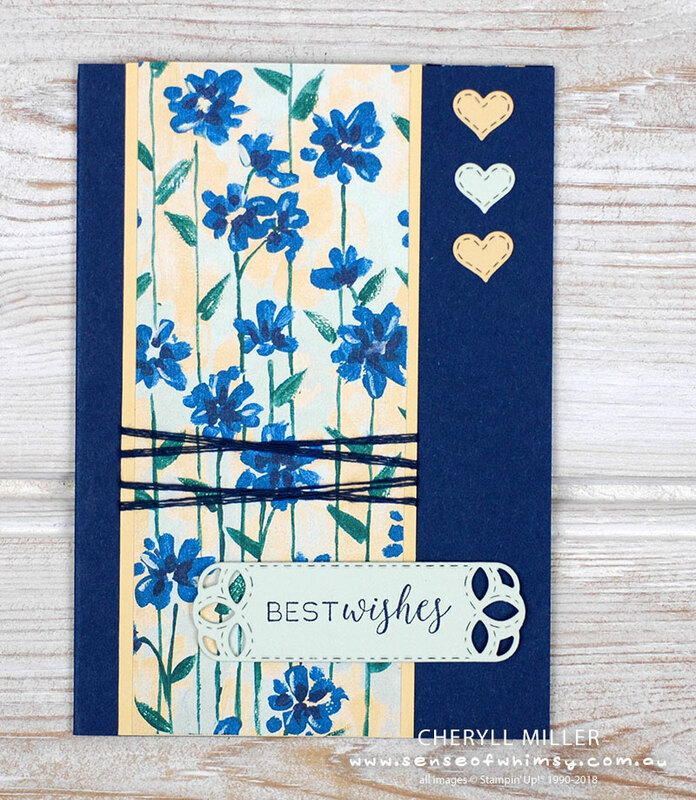 Love the cards that you have made with this amazing dsp. It all goes together so well Cheryll. Oh Cheryll. These are all amazing but my 2 faves are the same as yours. I love all of the little details that you always add. The embossed DSP and the way you added detail to the card insides are just too clever! Thanks so much Lou, and thanks for organising this amazing hop! 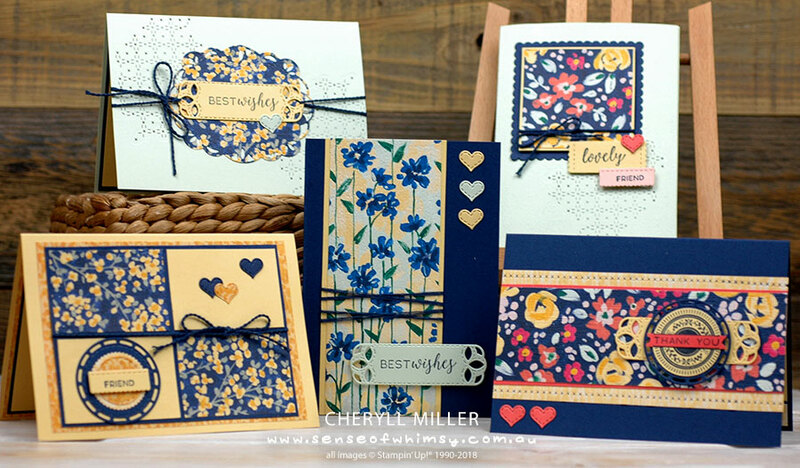 Oooo, embossing the DSP as well – what a fab idea! Takes it to the next level again. This is such a pretty collection of cards. Those blue and yellow papers are my favourites from this collection so I’m glad you’ve chosen to share those. 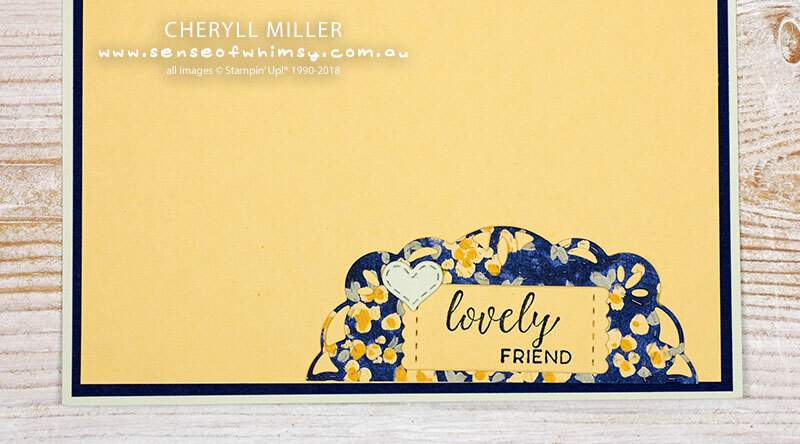 Stunning collection of cards Cheryll. I can’t even choose a fave! I adore the colours you have chosen as your bases, your choices really do make that DSP POP! Beautiful Cheryll these are such pretty cards and because the dsp is from the same stack they would be perfect as a gift set . Gorgeous cards Cheryll, I might need to take another look at that DSP. It didn’t really inspire me in the Catalogue but after seeing your cards I think i “need” to order some. Yes Peta, I was a little bit the same. The colors seemed bright and primary which normally isn’t my thing, but I have used nearly all the designs in some shape or form over the last month. Oh Wow Cheryl! Love them all! Youve showcased this DSP beautifully! Thanks so much Mandy. I am loving the Subtle embossing folder. What a lovely set of cards!! It’s such lovely dsp. 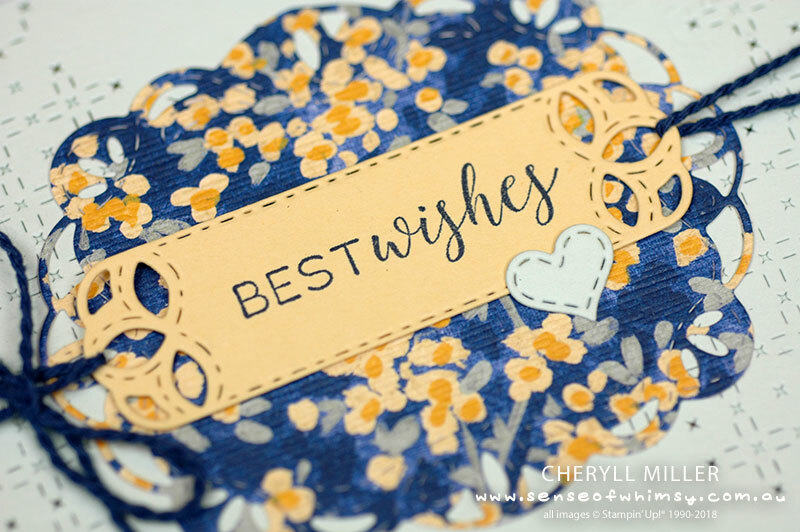 I love all your cards Cheryll. I can’t wait to see the others later in the week. That paper stack is so delightful, I don’t blame you for getting carried away.